Hilton Worldwide today announced an exclusive license agreement with Plateno Hotels Group, one of China’s leading hospitality groups, to rapidly launch and develop the Hampton by Hilton brand in China. With this agreement, Hampton plans to have over 400 deals signed, with the first hotel expected to open by the end of 2015. Hampton by Hilton is a leader in the mid-priced hotel segment with nearly 2,000 properties in 17 countries. Plateno Hotels Group operates five brands with a portfolio of over 3,000 hotels in 300 cities across China and operates China’s largest hotel loyalty program, reaching 80 million members. China has a growing demand for the mid-scale hotel market and has a low supply of 3- to 3.5-star hotels. Hampton has designed a 3-star hotel prototype to fit top-tier cities in China, serving value-conscious, quality-driven business and leisure travelers. Hampton by Hilton’s portfolio in China will be a mixture of new builds, conversions and adaptive reuse properties. Plateno Hotels Group will lead the development and management of the hotels. 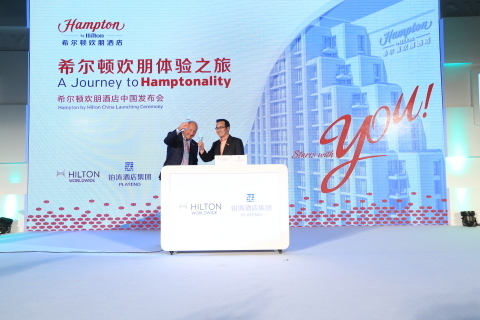 Guests of Hampton by Hilton hotels in China will be able to participate in the globally recognized loyalty program, Hilton HHonors. Plateno Hotels Group operates China’s largest hotel guest loyalty program with more than 80 million members, which will provide a new source of guests for Hampton by Hilton in China. The partnership will also provide an opportunity to educate Chinese guests about Hilton HHonors and Hilton Worldwide’s other best-in-class brands. Combined with Hilton Worldwide’s 43 million Hilton HHonors members in 94 countries, over 120 million travelers from China and around the globe will be able to earn rewards by staying at Hampton by Hilton hotels in China. Hampton and Plateno share common views on how best to serve guests. Plateno’s focus on a collaborative, fun-spirited brand culture that empowers team members to exceed guest expectations and needs is similar to Hampton’s culture of Hamptonality, the brand’s friendly and authentic approach to hospitality. For more information, please visit http://news.hiltonworldwide.com or http://news.hampton.com. Hampton Hotels, including Hampton Inn, Hampton Inn & Suites and Hampton by Hilton, is an award-winning leader in the mid-priced hotel segment, serving value-conscious and quality-driven travelers. With over 1,900 properties totaling more than 195,000 rooms in 17 countries and territories, Hampton Hotels is part of Hilton Worldwide, a leading global hospitality company. All Hampton hotels offer a friendly service culture, defined as Hamptonality, delivered by more than 50,000 Team Members and backed by the 100% Hampton(R) Guarantee, reinforcing its commitment to providing excellent service to business and leisure travelers alike. High quality and consistent accommodations and amenities, such as complimentary Wi-Fi, Hampton’s On the House(R) hot breakfast, the latest technology and innovations like multi-unit Power Cubes and the brand’s signature Clean and fresh Hampton bed(R), combined with numerous locations globally have made Hampton a leader in its segment and one of the fastest growing hotel brands worldwide. Please visit www.hampton.com, http://news.hampton.com or www.hamptonoffers.com for more information and connect with Hampton Hotels online at www.faceboook.com/Hampton, http://twitter.com/Hampton or www.youtube.com/Hampton. Hilton Worldwide (NYSE:HLT) is a leading global hospitality company, spanning the lodging sector from luxury and full-service hotels and resorts to extended-stay suites and focused-service hotels. For 95 years, Hilton Worldwide has been dedicated to continuing its tradition of providing exceptional guest experiences. The company’s portfolio of 12 world-class global brands is comprised of more than 4,200 managed, franchised, owned and leased hotels and timeshare properties, with more than 690,000 rooms in 94 countries and territories, including Hilton Hotels & Resorts, Waldorf Astoria Hotels & Resorts, Conrad Hotels & Resorts, Canopy by Hilton, Curio – A Collection by Hilton, DoubleTree by Hilton, Embassy Suites Hotels, Hilton Garden Inn, Hampton Hotels, Homewood Suites by Hilton, Home2 Suites by Hilton and Hilton Grand Vacations. The company also manages an award-winning customer loyalty program, Hilton HHonors(R). Visit news.hiltonworldwide.com for more information and connect with Hilton Worldwide at www.facebook.com/hiltonworldwide, www.twitter.com/hiltonworldwide, www.youtube.com/hiltonworldwide, www.flickr.com/hiltonworldwide and www.linkedin.com/company/hilton-worldwide.